We began working with Providence’s exquisite, high-end Mediterranean restaurant Quay when it was still just an idea. Before construction even began on this stunning modern marvel, we worked with Quay’s team on branding their one-of-a-kind location, unforgettable atmosphere, and impeccable cuisine. This all began with several “making of Quay” videos for social media, where we first showcased our slick, elegant logo and signage. This logo appears in our personally designed print advertisments, menus, literature, as well as on the building itself. We also played a vital role in Quay’s interior and exterior design, beginning with an essential sandwich board which directs pedestrians down the Riverwalk. 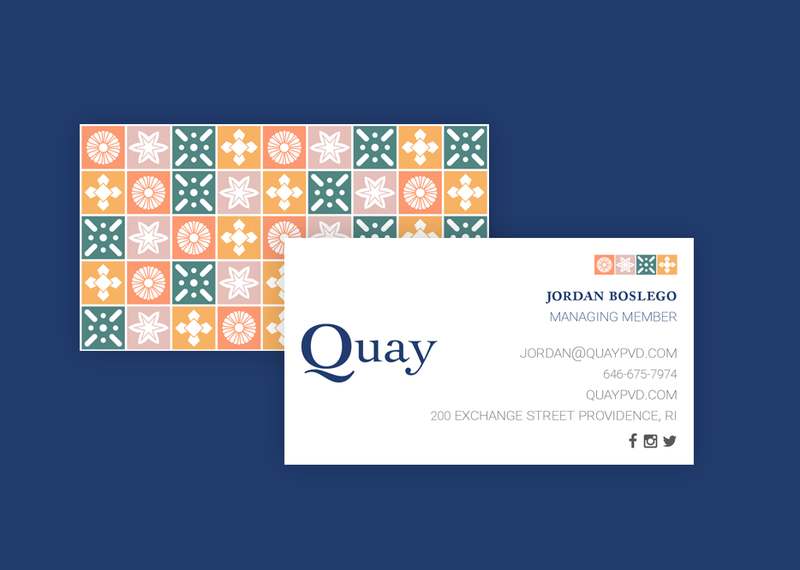 In addition to this, we created business cards, dinner, cocktail, and brunch menus inspired by Mediterranean designs with borders that resemble Quay’s unique railings, which can be found throughout the restaurant. Finally we created an eye-catching website whose homepage exhibits our stunning photography and drone video of Quay at twilight, with its soft, inviting light reflecting luminously off the water of Providence’s gorgeous Riverwalk.